Syracuse University’s Remembrance Week 2016 will be held on campus Sunday, Oct. 23, through Saturday, Oct. 29. Syracuse University’s Remembrance Week 2016 will be held on campus Sunday, Oct. 23, through Saturday, Oct. 29. 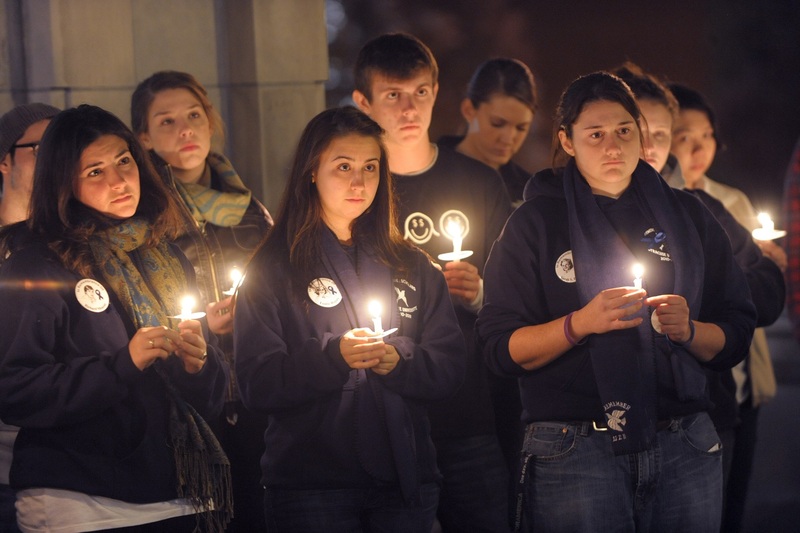 The weeklong series of events honors the 270 people, including 35 students studying abroad through Syracuse University, who lost their lives in the terrorist bombing of Pan Am Flight 103 over Lockerbie, Scotland, on Dec. 21, 1988. Each year, 35 Remembrance Scholarships—one for each of the 35 student victims—are awarded in the amount of $5,000 to undergraduate seniors representing a broad range of majors. The Remembrance Week events planned and hosted by the students are meant to honor the victims and further education about terrorism. Remembrance Week activities are all free and open to the public, unless otherwise noted. Pen-and-ink drawings of the 35 student victims will be on display in the Panasci Lounge, located on the third floor of the Schine Student Center. Candid posters of the victims will be displayed in buildings throughout campus. An exhibition of 35 empty chairs on the Kenneth A. Shaw Quad, an installation created by the 2012 Remembrance Scholars, juxtaposes the visual representation of the 35 students lost with good deeds inscribed upon the chairs. The exhibition is meant to serve as a reminder of how a loss in the past can inspire positive actions in the present. Remembrance Scholars will visit classes around the Syracuse University campus to educate fellow students about the tragedy. Remembrance Scholars will also work with local youth on a poetry project at ELMS Middle School, a photography project at Ed Smith School and at the Boys and Girls Club Central Village. At the card making events listed below, the scholars will collect donations of canned goods and other non-perishable food items to benefit the Hendricks Chapel Food Pantry. Donations may also be dropped off in the Hendricks Chapel Dean’s Office. Hendricks Chapel will be lit in blue during Remembrance Week. A candlelight vigil will begin at 7 p.m. in Rooms 304A, B and C of the Schine Student Center and conclude at the Wall of Remembrance. Members of the University community are invited to join the Remembrance Scholars in making cards for first responders from 9 a.m. to noon in Schine Student Center Room 228. A pop-up museum, with information about the bombing of Pan Am Flight 103 and Syracuse University’s Remembrance activities, will be set up on the Einhorn Family Walk (Promenade) from 10 a.m. to 4 p.m.
A panel discussion on “Doing Memory, Doing Justice” will be held at 7 p.m. in Slocum Auditorium. An interdisciplinary group of scholars and activists will address the politics of memory as a mediated and malleable force. Beginning from reflections on their research and activism around traumatic memory and narratives of terrorism, the panel speakers will encourage a discussion of the challenges of remembering the bombing of Pan Am Flight 103. Panelists will include Shannon Novak, associate professor of anthropology in the College of Arts and Sciences and the Maxwell School; Lynne Jackson, co-founder of Project SALAM (Support and Legal Advocacy for Muslims); and Charisse L’Pree Corsbie-Massay, assistant professor of communications at the S.I. Newhouse School of Public Communications. The panel will be moderated by Farrell Greenwald Brenner, a 2016-17 Remembrance Scholar, and Ahmed Malik, Syracuse University Muslim chaplain. Members of the University community are invited to join the Remembrance Scholars in making cards for first responders from 10 a.m. to 2:30 p.m. in the Schine Atrium. “A Celebration of Life” will be held at 7 p.m. in Hendricks Chapel. Students will present an evening of performances and remembrances to honor and celebrate the lives of those lost on Pan Am Flight 103. The Interfaith Dialogue Dinner Series event on “Islamophobia on Campus” is part of Remembrance Week and will begin at 6:30 p.m. in the Noble Room of Hendricks Chapel. The series is sponsored by the Disability Cultural Center and Hendricks Chapel. Materials from the Pan Am Flight 103/Lockerbie Air Disaster Archives will be on display from 2-5 p.m. in the Spector Room, 608 Bird Library. The recent PBS documentary “My Brother’s Bomber” by Ken Dornstein will be shown beginning at 6 p.m. in Newhouse 3, Room 141. Dornstein’s brother, David, was a victim of the Pan Am 103 bombing. Materials from the Pan Am Flight 103/Lockerbie Air Disaster Archives will be on display from 9 a.m. to noon in the Spector Room, 608 Bird Library. The Annual Rose Laying ceremony, to remember the Syracuse students killed in the Pan Am 103 bombing, will be held at 2:03 p.m. at the Place of Remembrance, located in front of the Hall of Languages. The Remembrance Convocation, honoring the 2016-17 Remembrance and Lockerbie Scholars, will be held at 3 p.m. in Hendricks Chapel. For information on Remembrance Week activities, visit http://remembrance.syr.edu or Twitter at #SURemembrance2016.